A national bestseller and a New York Times notable book, now in Grove Press paperback for the first time, In the Fall is a richly layered epic that conjures the history of three generations of an American family and the dark secrets that blister at its core. At the close of the Civil War, Norman Pelham, son of a Vermont farmer, is found wounded by Leah, an escaped slave harboring a devastating secret. The two become lovers as Leah nurses Norman back to health, and journey north together as man and wife. Their son forsakes the family for the anonymous world of bootlegging and nightclubs, but long-buried truths come to light when their grandson is driven to retrace his history and disentangle his complicated inheritance. 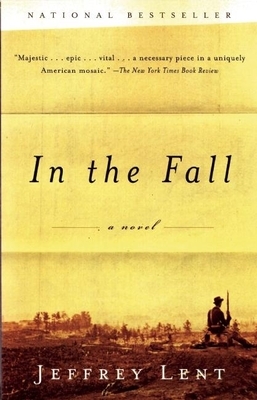 Spanning the post-Civil War era to the edge of the Great Depression, In the Fall is a fierce, gripping vision of an American landscape and history, and an unforgettable portrait of an American family. Jeffrey Lent is the author of four novels: After You've Gone, A Peculiar Grace, Lost Nation, and In the Fall, which was a national best seller.